By this point in the trip it was obvious to me that when you’re on a motorcycle, a change in weather can make an amazing difference. The weather prediction right on target when we woke up in Carleton-sur-Mer: dry, clear, pleasant temps in the 60s and low 70s, perfect for riding. So it was a no-brainer to stay here another day and do some inland riding back to the Chic Choc Mountains. Since we were going to be out all day and probably far out of range of restaurants, we made our first stopped the local Subway, to grab some sandwiches. The ride first backtracked east along the coast to New Richmond, before heading up Rt 299. It’s funny how the ride gets better in the sunshine. The road to New Richmond was the same one we came in on, but now I noticed sparkling blue water to my right, round green hills to my left, quaint farmhouses, and attractive beaches covered with colorful stones. Where was all this stuff yesterday? Our route up Rt 299 followed the Cascapedia River as we wound up the road into the interior of the Gaspé Peninsula, eventually rising to about 660 meters elevation. At that point we reached a sort of “continental divide” and the waters started to run north instead of south. You can cross the peninsula on this road in about 2.5 – 3 hours. 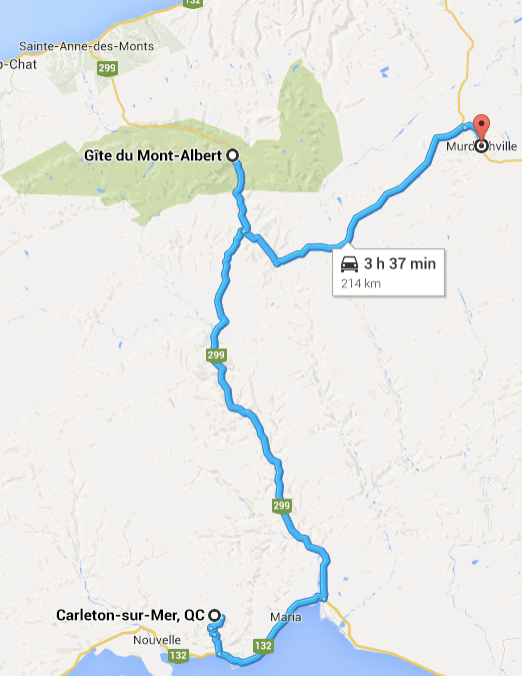 We didn’t go quite all the way, but turned around at Gîte Mont-Albert, an inn/resort up in the mountains. Just a couple of miles back I noticed a sign for “Chutes” (waterfall) and called the guys on the intercom. A short walk into the forest put at the ideal lunch stop, and amazingly, up here in the mountains in June, there we absolutely no biting insects to be found. Guess they were on vacation. Although Steve caught my in this photo without a smile, trust me, I loved this spot. We picked out a nice spot on the rocks and soaked up a bit of sun while eating lunch. I could have chilled out there for hours. This was one of those peak “vacation moments” when everything was exactly right: perfect air, no bugs, great scenery, the sound of the water falling, nobody else around, and no schedule. Now here’s where it gets weird. We had some extra time to kill on the way back, and Steve wanted to take a side trip down a dirt road (of course) which led east and eventually (44 km later) ended up in Murdochville. Remembering my promise to agree to ride wherever he suggested, I followed along. But I was thinking that this was a pointless trip, since there wasn’t anything to see in Murdochville. We were just there three days ago, in pouring rain. Well, I was sort of right but mostly wrong. The dirt road wasn’t anything exciting, just another dirt road. But at the end, we found several interesting diversions in Murdochville. First, Steve & Eric had to go explore a giant tailings pile leftover from the copper mining operations. Then, we easily found the access road that led up to some of the local wind turbines. They were spectacular. Even though you can see that the blades come nowhere near the ground, when you stand beneath them and the huge blade comes swooping down with a giant whoosh, it’s hard not to involuntarily flinch or duck. So it was strange to be back here. One tourist visit would normally be enough to this town, but we went twice. And I’m glad we did. All that dirt road (88 km round-trip) meant all the cleaning we got from the rain was undone. I hung about 1/4 mile back from the other guys because I got tired of breathing dust from their bikes. But when when a logging truck passed there was no hope at all of avoiding the dust. At one point two of them passed us and it was a virtual white-out. We had to just pull over and wait a couple of minutes for visibility to return. Once we reached Rt 299 again, we were on pavement, and conditions couldn’t be better. I led the group all the way down, winding through the turns along the river at about 55 MPH, for two hours. There was little traffic on Rt 299, so most of the time we owned the road. I know that last stretch of road made me feel like staying in the area for another week. Tonight we are back to camping. Carleton has a nice public campground on the bay, located far out on a narrow spit of land. It’s so low in elevation that a tide of four feet would probably flood the place, but I gather there’s not much tide here. The campground has nice sites, good wifi, good shower houses, and was $25 for a tent site. We grabbed two sites, and I had one of them to myself. After setting up camp, we rode back to town to grab dinner at a restaurant overlooking the bay. (Everything overlooks the bay here, so that’s not as unique as it might seem.) Next door was a dairy bar with an ad for poutine ice cream, but even Steve wouldn’t dare try that. I had a disappointing “milkshake,” because I forgot that in Quebec milkshakes are mostly milk. I also got a bad-news phone call from my business partner about contractual dispute with a vendor who was being a major PITA. But nothing was going to ruin this day … and I slept in my tent that night with the satisfaction of having had a wonderful adventure.